The ransomware epidemic is forcing IT to think differently about how they surveil and defend their organization's digital assets. 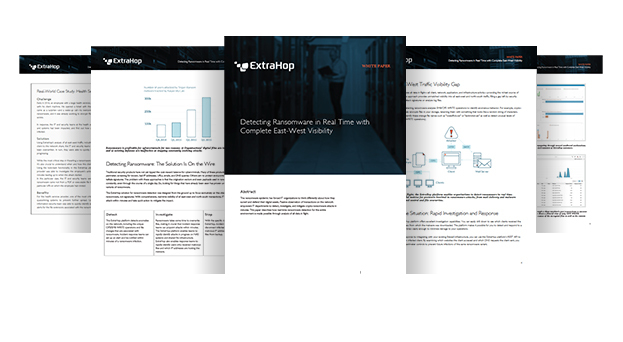 To effectively identify and control ransomware, organizations need real-time visibility into communications within their networks (east-west traffic), not just what crosses the perimeter (north-south). Take control of ransomware with unparalleled investigation capabilities; Learn how you can identify which clients received the malicious file and how to find and block the IP address from which the malware was downloaded. Discover how one health-services provider's IT team leveraged ExtraHop to identify and isolate compromised systems quickly, and avoid paying a ransom. Access an ever-expanding base of ExtraHop users to see how others in your field are building a real-time library of security-focused solutions.